Many people want to stay in touch with their alma mater even after graduation. The WU Alumni Club acts as a link to the university and promotes networking between graduates of all ages. WU graduates are in very high demand in the labor market. Many enter into an international career or leave Vienna to work in other parts of Austria, and membership in the WU Alumni Club gives them the opportunity to build up networks with other WU graduates and to stay in touch with the university. WU’s international network currently consists of alumni hubs in over 50 cities worldwide. In 2016, new hubs were established in Lima, Paris, Teheran, and Toronto. WU alumni contacts are also located in seven Austrian cities across the country. These volunteer hub representatives organize events and alumni meet-ups. When planning events, they orient themselves on local customs and habits and on the needs of their local alumni. International alumni meetings with the rector are always a special highlight: In 2016, Rector Edeltraud Hanappi-Egger met with WU alumni at the Budapest, Boston, and London hubs. Our alumni want to stay up-to-date on what’s going on at WU and in the WU Alumni Club. Our most important communication channels are social media and the club newsletter WU.Alumni.News, published three times a year in cooperation with the Austrian daily newspaper Die Presse. 40,000 issues of the newsletter are sent out to alumni around the globe. In addition to current business and economics topics, the newsletter reports on WU research projects, new developments in teaching, and the activities of the WU alumni network. An eBook version of the WU.Alumni.News was launched in 2016. A balanced mix of business, social, and cultural events allows WU graduates to meet and network with other alumni on a regular basis. In 2016, lectures and the WU Alumni Tuesday, held weekly in a local restaurant, included topics like “What’s new at WU?”, Google AdWords, and the effects of positive role models. On June 16, 2017, the first annual WU Summer Celebration was held on Campus WU. The WU Alumni Club offered an exclusive lounge area for its members. 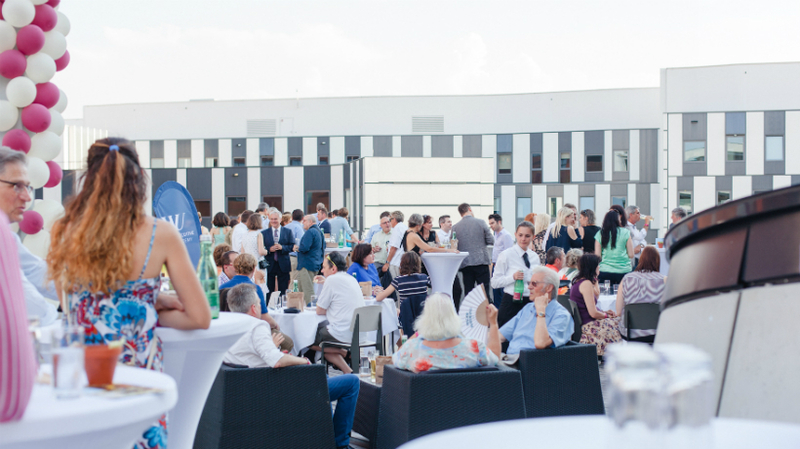 Over 800 guests from the business community, academia, and the media enjoyed the summer evening on the roof terrace over the Mensa cafeteria building, meeting up with old friends from student days, making new contacts, and participating in the Summer Celebration fun.